"Splintered" is the debut novel of playwright and award-winning screenwriter Thomas London. A journeyed explorer, Mr. London’s style is influenced by both his passion for history and his love of exotic locales - both of which feature in his upcoming work, "The Masada Option." Mr. London is a veteran of the Armed Services, holds an M.A. in Entertainment Business, and is an avid automobile and motorbike enthusiast. He currently spends his time in Los Angeles, California and in Ireland. Splintered by Thomas London is a humorous twist on an old fairy tale. We all know the story of Pinocchio, and we all know that he couldn’t lie. Now Pinocchio is a politician and he can’t tell the truth to save his life. Once upon a time, Pinocchio was a junior analyst and nobody took any notice of him. One fateful encounter leaves him with a label, “the last honest man in Washington,” and that label leads to him being a pawn in a corrupt political game. His marriage is falling apart and so is his family and, to save face, he tells a whopping lie, one that has a monumental effect on him. Now he is a puppet again and he has one week to break the spell or he will live the rest of his life as a piece of wood. He needs some serious help here and where else would you turn but to a talking insect and a drunk fairy? Splintered by Thomas London made me giggle quite a lot. I remember the original fairy story but this one was so much better. It had a great plot with some wonderful twists in it. It appears to be a predictable story but somewhere along the line, things take a turn that sends the story in a completely different direction with a superb ending. Mr. London has drawn up some excellent characters here, and they fit the story perfectly. It is entertaining yet there is an undercurrent of political truth to the story. And it is one of those books that you can’t pace yourself with. Once you start reading, that’s it. You won’t put it down until you have finished and you will be wanting more, I can guarantee you that much. Excellent twist on an age-old fairy story, absolutely loved it. Splintered by Thomas London is the story of Pinocchio. Yes, you read it right. The novel is set in the time when Pinocchio was a real boy and now he is a man who is married to a beautiful woman and has a little boy. He is like a real human and is loved by everyone because he always speaks the truth. Soon he is given the title of the “Last Honest Man in Washington” and is the poster boy of a congressman’s deceitful plan. This has put strains on his relationship with his family and his father who is too old. He does not believe the stories his father tells about his younger years, but when he lies on national television, he realizes that all his father’s stories were true: and he is in a lot of trouble. Now he must get help from some very unusual friends to break the spell before it is too late. Splintered is such a charming novel. I loved it and enjoyed it immensely. I am so glad I picked this novel. I loved the spin Thomas London put on the classic fairy tale and made it a satire on the current political situation of the world. I loved the way Pinocchio was used to portray the fragile condition of human values. The magical elements bring a sense of fantasy and thrill to the story. London wrote the novel in a fluid way that felt effortless. Splintered was flawless and I cannot find a single bad thing to point out. From the beautiful cover to the ending of the novel, Splintered was a thoroughly enjoyable read! Fun, fun, fun! That is what I thought when I finished reading Splintered by debut novelist Thomas London. Follow our hero Pinocchio (yes, that Pinocchio, but what other Pinocchio could there possibly be, really?) as he is first quietly working as a junior analyst at a large lobbying firm. No one knew him, and that's pretty much the way he liked it. But when he's named "The Last Honest Man in Washington," well, that's when the story really gets started. Pinocchio suddenly finds himself to be an overnight celebrity in Washington. But when he finds himself a puppet in a corrupt congressman's political maneuverings, at risk of ruining his relationships with his father and wife, and telling a huge lie in front of a national audience on live TV, he becomes more than just a metaphorical puppet, he turns back into his original form. He has only one week to turn back to his human form, and needs the help of quite a cast of characters to do so. I loved this book. LOVED it. I laughed, I was intrigued, I enjoyed this book from its start through to the finish. The interweaving of a fairy tale in such a politically based story was a stroke of genius, and I absolutely give author Thomas London mad, mad props for writing this amazing book. 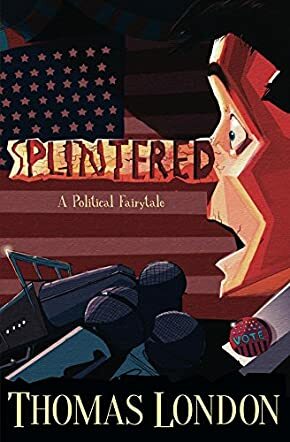 Splintered would be enjoyed by any lover of inventive fiction, fairy tales, writing related to politics, suspense, or just a great, funny read. I can recommend Splintered highly, and am very much looking forward to seeing what author Thomas London has in store for his readers.